d'Urville Island (/dɜːrˈvɪl/) is an island in the Marlborough Sounds along the northern coast of the South Island of New Zealand. It was named after the French explorer Jules Dumont d'Urville. With an area of approximately 58 square miles (150 km2), it is the eighth-largest island of New Zealand, and has around 52 permanent residents. The local authority is the Marlborough District Council. The island has a convoluted coastline, as is frequently found with islands formed from peaks between sea-drowned valleys. It extends for some 35 kilometres (22 miles) northeast/southwest, and is a little over 10 kilometres (6.2 miles) wide at its widest point. 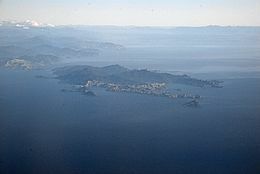 The eastern coast of the island is relatively smooth, marked mainly by the small d'Urville Peninsula, some halfway along its length. In contrast, the west coast is marked by three large inlets: Port Hardy in the north, Greville Harbour in the centre, and Manuhakapakapa in the south. Numerous smaller islands lie off the coast, notably Stephens Island, which lies 3 kilometres (1.9 miles) off d'Urville's northernmost point, Cape Stephens. The island's highest point, Takapōtaka / Attempt Hill (729 metres or 2,392 feet) lies close to the centre of the island, due east of Greville Harbour. Most of the island's residents live close to the more sheltered east coast, with the localities of Patuki and Mukahanga being close to the northern tip of the island. The Māori name is Rangitoto Ki Te Tonga. The local tribes are Ngāti Koata and Ngāti Kuia. The island is separated from the mainland by the dangerous French Pass, known to Māori as Te Aumiti, through which water passes at up to 8 knots (15 km/h; 9.2 mph) at each tide. Several vortices occur near this passage. d'Urville investigated the passage for several days in 1827, and damaged his ship passing through it. A small Department of Conservation maintained airstrip is located at Moawhitu, Greville Harbour. Pelorus Air has flights to d'Urville Island from Picton, Wellington and Paraparaumu. A barge service is operated by d'Urville Island Getaway between French Pass village and the settlement of Kapowai. There is also a water taxi operating between the d’Urville Island Wilderness Resort at Catherine Cove and French Pass. In 2016, Motueka based Abel Tasman Sea Shuttles hosted a number of charity cruises around d'Urville Island in conjunction with the Rotary Club of Motueka. ^ "Attempt Hill, Marlborough - NZ Topo Map". Land Information New Zealand. Retrieved 2017-10-17. ^ a b Gerard Hindmarsh (2006). "Discovering D'Urville". Heritage New Zealand. Archived from the original on 11 May 2011. Retrieved 13 January 2011. 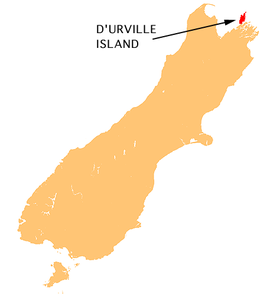 Wikimedia Commons has media related to d'Urville Island, New Zealand. This Marlborough Region-related geography article is a stub. You can help Wikipedia by expanding it. This page was last edited on 21 February 2019, at 21:25 (UTC).